Being a good host or hostess takes quite a bit of planning and energy to make sure everyone is comfortable and has a good time. If you have been a guest in someone's home, a thank you note is the best way to show your gratitude. 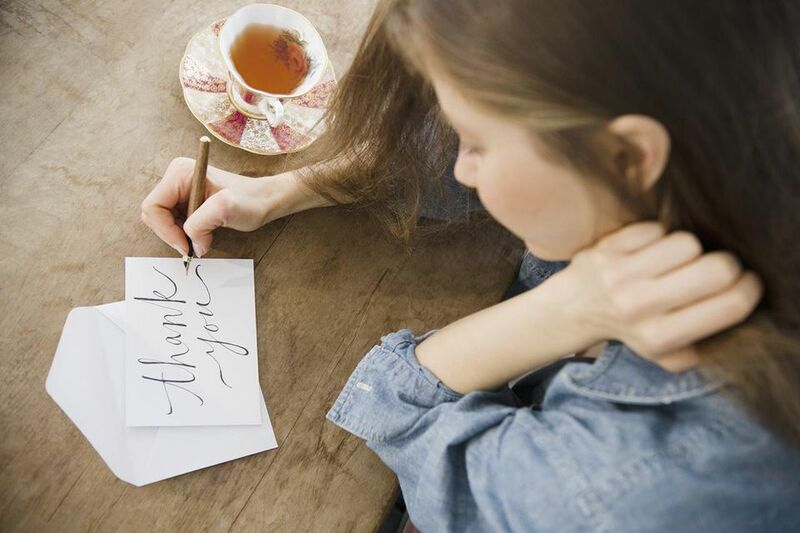 As soon as possible after you get home from visiting someone for an overnight stay, attending a celebration, or going to a dinner party, proper etiquette dictates sending a thank you note. It doesn’t have to be a long letter, but it should convey your deepest gratitude. Hosting requires quite a bit of time and effort, so this gives you a chance to acknowledge that. A thank you note isn't expected to be a work of art or a way to show your cleverness. The key is to write something that shows your sincere appreciation. You need to include certain elements for the most effective message. Always start your letter with a comment of thanks. Add something specific about the time you were there. Close with a statement about seeing the person again, and don’t forget to sign your name. You may also send a gift to show your gratitude, even if you brought a host or hostess gift, but it isn't necessary. Show appreciation for the hospitality. Expression something specific, such as a special meal or activity. Offer to reciprocate. While this isn't necessary, it's always a good idea to do this. Wrap up with a closing sentence. Show appreciation for being invited. Express congratulations or something related to the celebration. Mention something you liked about the meal. Even if you didn't care for the food, you can mention something you did enjoy, such as the wine selection. Express a desire to get together again soon. If you plan to host a reciprocal dinner party for all those you've been invited to, you may want to mention it. Thank the person for having the tea party and inviting you. Mention something specific about the event, such as the interesting hats, teacups, or the program. Let the person know you look forward to seeing her again. You might mention something about the pictures you took at the tea party. Start with saying, "Thank you." Mention something personal about the conversation or your relationship. Let the person know you look forward to getting together again soon. Thank the person for inviting you to the holiday event or dinner. Mention something specific. If it's Thanksgiving, the food is always good to bring up. You may want to ask for a recipe or bring up the fact that you had seconds. Close with something specific that shows some sort of reciprocal agreement. If you're hosting a New Year's party, let them know the invitation will be coming soon. Thank you for inviting us to your home for that lovely dinner party to celebrate Joan's promotion. Not only was the dinner delicious, but we are also happy to know that your efforts have resulted in the great reward of your new position. The whole evening was delightful. The lamb you served was cooked to perfection. I can't ever remember tasting anything so delicious. We also enjoyed hearing all the stories about your college days and how hard you worked to achieve success. We look forward to seeing the two of you again soon. Next time, we'll have you over to our house. Talk to you soon. It's always a good idea to follow up on any thank you notes you send. If you haven't already sent a gift, you can do that now. If you make any promises, such as a reciprocal dinner invitation, follow through.